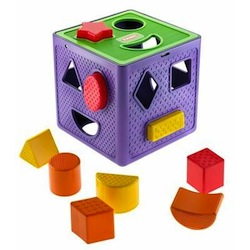 This multi-textured cube and basic shapes makes it fun for toddlers to learn their shapes and colors! Kids match the colorful shapes and textures with their corresponding holes. The shapes store inside the cube for easy storage and shape-sorting fun on the go. " Colorful shape sorter makes it fun for toddlers to learn shapes and colors with nine different colorful shapes!" Ages 18 months and up.